I read Kieran Shea’s debut and it was a definite hit. 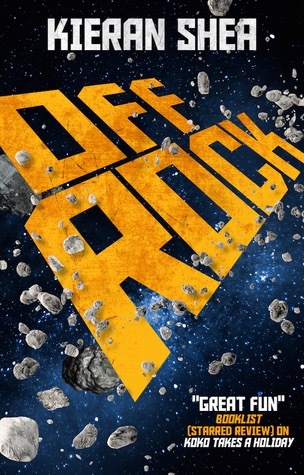 Similarly, Off Rock has all the panache, creativity and excitement but this time packaged up as a classic crime caper set in a far future, space mining facility. There’s a good natured vibe to the book that keeps the fun ratcheted up high even when the action truly kicks off. Jaded and complacent, Jimmy Vik, is fairly set in his ways, working for various mining companies that exploit the material rich outer reaches of space. He’s bounced around, lived the maxim of ‘work hard, play hard’ and is now getting to that stage in life where he’s stuck with his lot and doesn’t care one way or the other. That is until he discovers a seam of gold, missed by the company scans and ripe for the taking. To Jimmy, it’s the chance to start everything afresh regardless of the very severe and life threatening punishment that comes with appropriating the mining company’s property. It sets in motion a series of events, bluffs and double crosses as Jimmy is stiffed by his accomplice, Jock. An indebted gambler with a huge criminal cartel on his case, Jock takes little time stitching up Jimmy. Off Rock has, to my mind, the feel of the Ocean’s Eleven movie as each actor brings to the story another complication. Setting up the main heist story for the first half of the book, things quickly unravel as Jock puts his own plan in motion. Sure enough, Jock the fixer is greasing wheels and doing deals. But, the cartel have eyes on him and are determined to get the account settled or, more accurately, terminated. Add in to the mix Jimmy’s ex-girlfriend and supervisor, who is far from stupid and tough to boot, the gold has gone from a sure thing to a hard sell. Off Rock is, from start to finish, a brilliantly fun read. It hits all the right notes of a caper as everyone scrambles to get their slice of the pie. Jimmy, as hard as he tries, continues to blunder into obstacles, and it looks like he’ll be lucky to get out alive. Off Rock is a strikingly impressive feat of writing from the characters and banter to the plot and conclusion. When all is said and done, this is a book that will keep you thoroughly entertained and leave you with a smile on your face.